I hate saying "the media" because obviously The Goldwater is also considered media, so I'll just say the mainstream, left-wing lie-factories are currently spewing some of the most ignorant propaganda so far. The worst part about what MSNBC is doing is they are relying on their viewers to be too dumb to know the truth or too lazy to find out for themselves. You might be wondering what I'm referring to, well the lamestream media outlet known as MSNBC aired footage of Border Patrol agents destroying water jugs in the dessert from the Obama era to paint a negative light on Border Patrol under the Trump administration. MSNBC's AM Joy was talking about the recent tragic death of a 7-year-old Guatemalan girl whose father forced her to march across the desert with no food or water. Upon reaching the United States illegally, the girl and her father was part of a group of 163 people who turned themselves in to Border Patrol agents. That is a lot of people to process in the desert in the middle of the night. At some point, the girl began having seizures and vomiting, lacking the necessary medical personnel to help the girl, agents radioed for a med-vac helicopter to airlift the young girl to a hospital. Emergency responders determined the girl hadn't eaten or drank anything in 72 hours and did their best to save her. Sadly, the little girl perished from the harsh journey and dehydration. That is sad, it's a sad story, but the blame does not lie on the Border Patrol, even if destroying water containers are still standard procedure under the Trump administration, and there is no evidence to show that it is, it would be a perfectly reasonable to discourage illegal immigration. We don't want criminals, drug-smugglers, and human traffickers or people seeking better lives entering the country illegally. We have a system in place and just because your an immigrant doesn't give you special rights that citizens don't have. 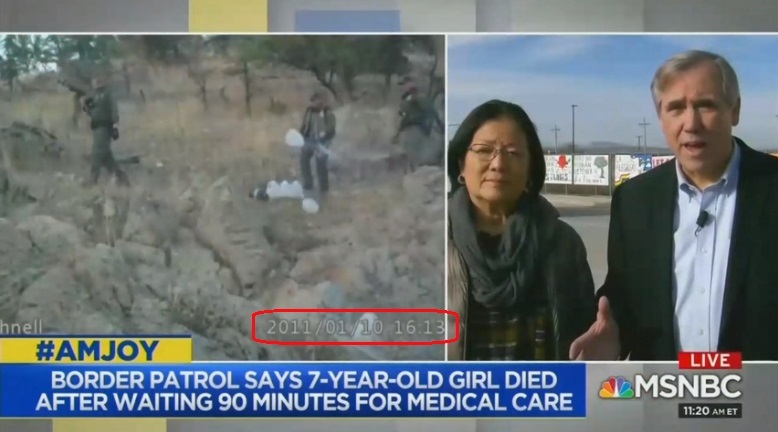 It really is a simple as that, so why is MSNBC knowingly lying about Trump's Border Patrol and airing footage from their left-wing idol Obama's Border Patrol? On the AM Joy show, the host Reid brings up the issue of water saying, "One of the issues was dehydration. We're going to show you some video ... but there is a video of Border Patrol agents dumping water on the groundwater that was meant to be left for migrants. This is from a Tucson-based aid group." Democratic Senators Mazie Hirono and Jeff Merkley responded to the video saying, "What do you know about whether water is being provided to migrants when they are picked up near the border?" An overlay on the screen prevented the timestamp of the video from being visible but it is visible just briefly at one point of the video and it shows 2011. Reid referred to the video as if it were Trump who was pouring out the water jugs, "We saw Border Patrol dumping water that was made for desperate migrants being dumped out on the ground. This sort of extravagant cruelty is unusual for any administration, but, for this administration, they seem to think it's effective for their base." The footage was also used by MSNBC host O'Donnell who aired the outdated video on his Friday night show "The Last Word" but did not tell viewers it was from 2011. This is not honest reporting and MSNBC is one of the largest news sources out there today. Don't buy into their propaganda, do some a little legwork and get to the truth, just bookmark TheGoldwater.com. Stupid is as stupi does. These people who run this network must have the IQ of a bag of hammers and expect their audience to be equivalent to the level of intelligence they possess.